I will be at Science Hack Day SF giving a lightning talk on Creative Off-Label Tool Use featuring some of the cool and unusual ways people are using AxiDraw and other tools we make. I’ll also have an AxiDraw in the hardware hacking area to play with. Science Hack Day is October 27-28 and is free, so register now! P.S. If you’re doing something interesting and science or research related with your AxiDraw, please let me know! This entry was posted in CNC, Field Trips, Science and tagged AxiDraw. Bookmark the Permalink. The Annotated Build It Yourself Science Laboratory is featured on Cool Tools today! This kind of bootstrapping science education is perfect for science museums, teaching labs, camps, and incredibly self-motivated kids. This entry was posted in Education, Science. Bookmark the Permalink. This year for Lady Ada Lovelace Day, I want to celebrate the many women who shared their projects at Maker Faire New York. I was thrilled to see the Touch Creature sculpture above by Talya Stein, especially after having seen an earlier version. She and I talked about the approachability of organic materials like wood. It was wonderful to see kids interacting with it. I had a great conversation with Blythe Serrano, who I had met at a previous Maker Faire, about the material properties she has learned this year from experimenting with silicone casting. She makes light up pet collars, and generously shares her learning processes. I loved this spatial magnetic field visualization by Inhye Lee. 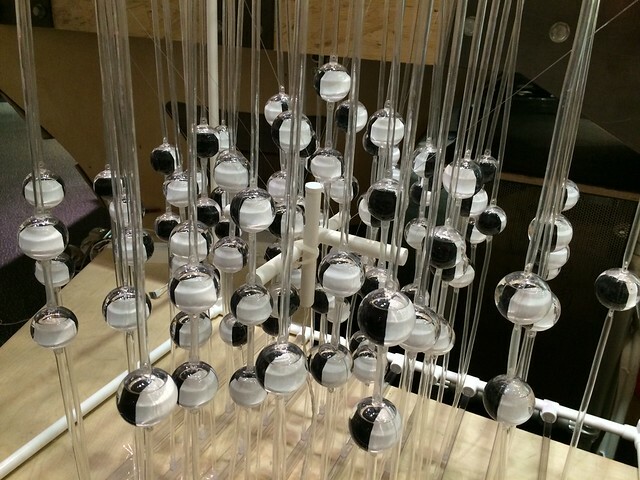 The three tubes in the center contain individually controllable electromagnets. The compasses spin in their spheres in response to the changing magnetic fields. There are so many more I had the pleasure of connecting with and catching up with, including Becky Stern, Sophi Kravitz, Star Simpson, and Sally Byers. I love Maker Faire for the opportunity to bask in the glow (LED glow in some cases) of so many incredible women. This entry was posted in Art, Education, Engineering, Science. Bookmark the Permalink. Windell will be giving a talk on Sunday at this year’s Maker Faire in New York. You can catch the talk on Sunday, October 2, at 2:30 PM, on the Make: Show & Tell Stage. The Annotated Build-It-Yourself Science Laboratory is available from Amazon.com, O’Reilly, and other sellers of books, as well as from our store. This entry was posted in Field Trips, Science. Bookmark the Permalink. I’ll be giving a talk and demo on Saturday at this year’s Maker Faire in San Mateo, CA. I’ll be demonstrating one of the many projects from my book, The Annotated Build-It-Yourself Science Laboratory (and signing books as well). You can catch the talk and demo on Saturday, May 21, at 1:30 PM, on the Maker Show & Tell Stage. This entry was posted in EMSL Projects, Science and tagged build-it-yourself science laboratory, makerfaire. Bookmark the Permalink. GeekDad has posted a very thoughtful review of the Annotated Build-It-Yourself Science Laboratory. A workbench with breadboards, 3D printer, and sewing supplies is nothing compared to building a full science lab from basement junk. 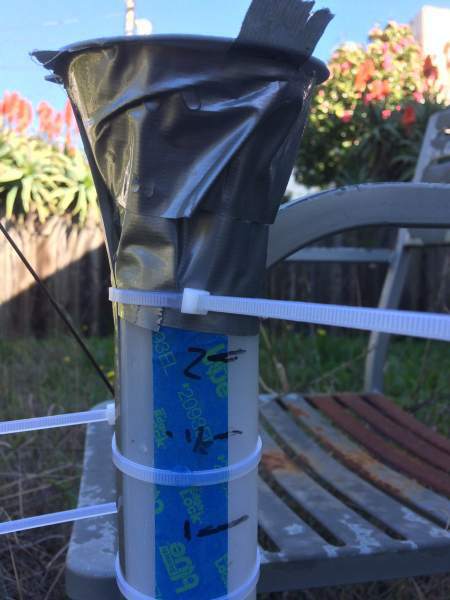 They went hands-on and built the rain gauge shown above. Windell is the guest on the most recent episode of Embedded.fm, titled Please Don’t Light Yourself on Fire. This episode’s contest prize is a signed copy of The Annotated Build It Yourself Science Laboratory. This entry was posted in EMSL Projects, General News, Science. Bookmark the Permalink. 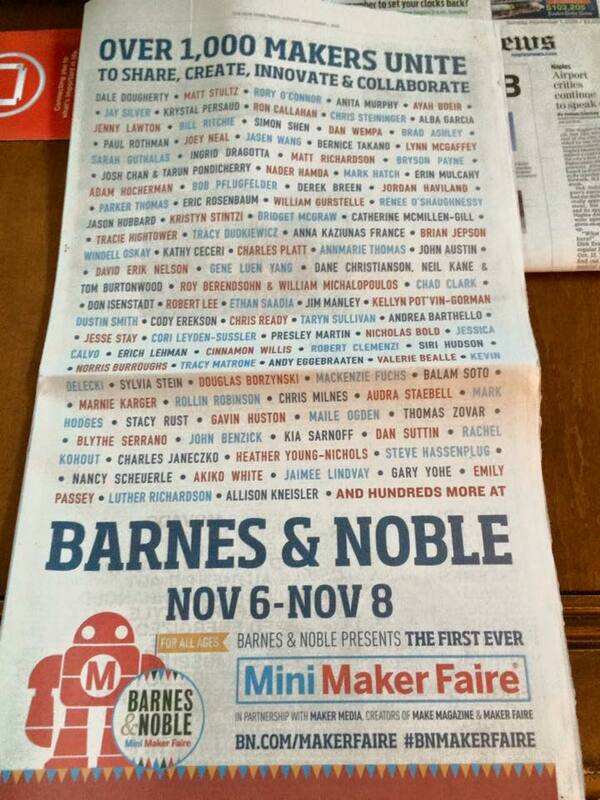 Barnes & Noble is putting on a Mini Maker Faire next weekend at stores across the country. As part of the event, Windell will be at the San Jose store on Friday, Nov. 6 at 1 pm with The Annotated Build-It-Yourself Science Laboratory. This month I’ll be traveling to Maker Faires in Portland, Oregon, and New York City to sign and talk about my book, The Annotated Build It Yourself Science Laboratory. That, of course, is the new, updated version of Build-It-Yourself Science Laboratory, the classic 1960’s hands-on science book by Raymond E. Barrett. The Portland Mini Maker Faire is being held September 12-13 at OMSI, the Oregon Museum of Science and Industry. I’ll be speaking on the Innovation stage at 11 AM on September 12. This is a bit of a homecoming for the book: Raymond Barrett was the Education Director at OMSI when he originally wrote the book. The World Maker Faire is September 26 and 27 at the New York Hall of Science in Queens, New York. I’ll be speaking on the DIY stage on both days. 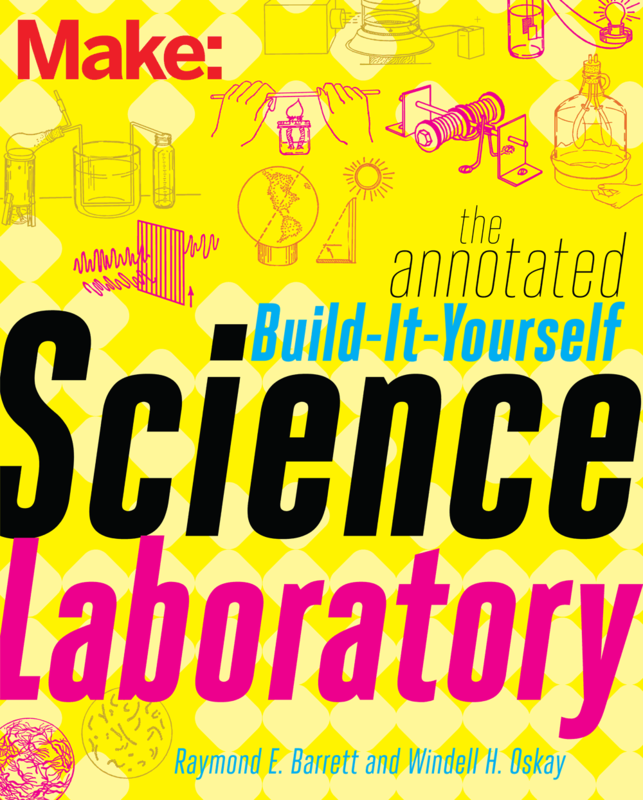 Bonus: During O’Reilly’s Back to School sale (through September 17), you can get the E-book version of The Annotated Build It Yourself Science Laboratory for 50% off using discount code B2S5. 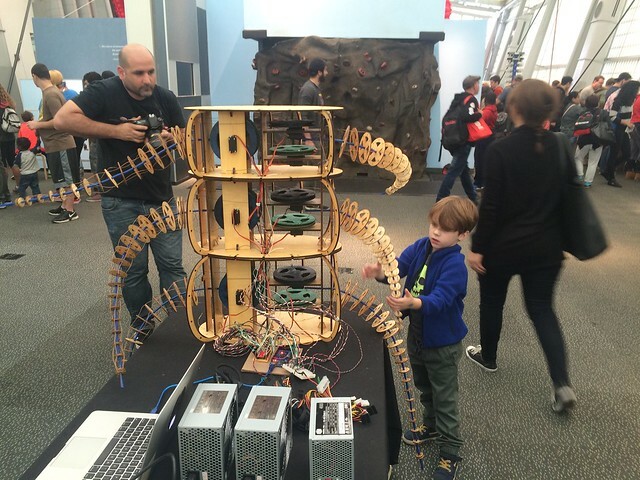 This entry was posted in EMSL Projects, Field Trips, Science and tagged build-it-yourself science laboratory, maker faire, makerfaire. Bookmark the Permalink. There is, of course, only one appropriate way to respond in a situation like this: with another comic. 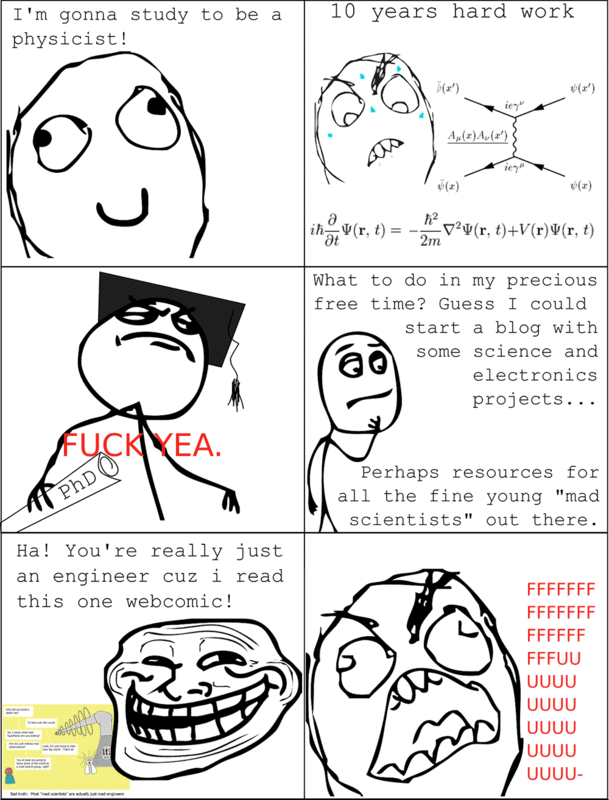 Back in 2011, I wrote an era-appropriate semi-autobiographical rage comic, that I could use as a standard response when people sent me that comic. Joking aside, we really do spend a lot of our time engineering— and many of our friends and colleagues are bona fide engineers. On the other hand, I love to cook, but that doesn’t make me a chef either. 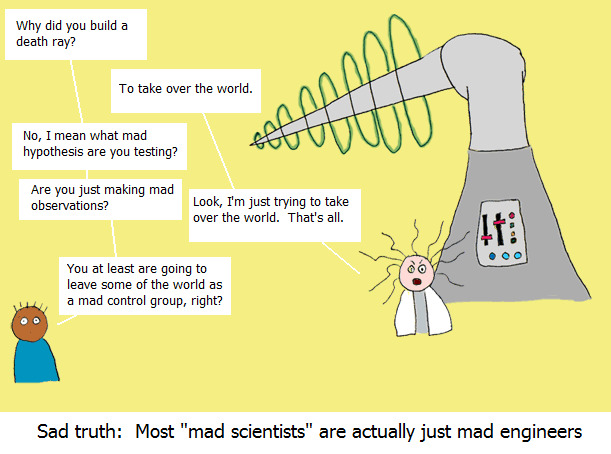 This entry was posted in Art, Engineering, Everything Else, Science and tagged comic. Bookmark the Permalink.